To create a material requisition flowchart, programs designed specifically for flowcharting purpose are particularly well-suited to the task. Edraw can create material requisition process flowchart from templates in minutes and be shared with anyone who uses PDF, Microsoft Word, Excel or PowerPoint. 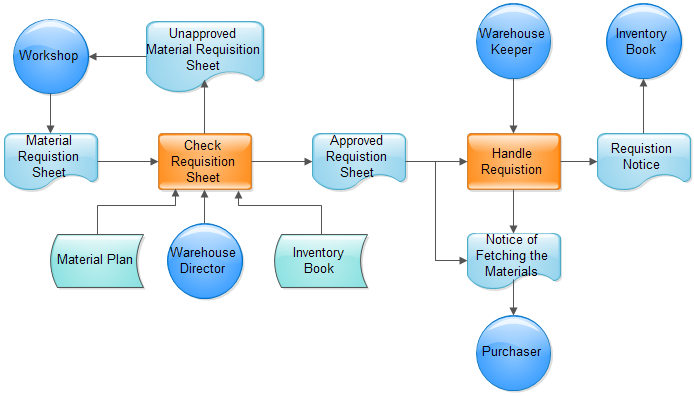 The following example shows the purchasing flowchart in material requisition procurement. The workshop fills out the material requisition sheet and sends it to the warehouse to ask for requisition. The warehouse director checks and approves the sheet in accordance with the material plan. The approved sheet is then sent to the warehouse keeper, or returned to the workshop if unapproved. Next, the keeper checks the inventory book, and notifies the workshop to come and fetch the materials if available, or, notifies the purchaser to purchase the materials if not available. 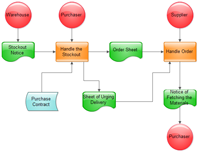 The following flowchart examples are created using Edraw flowchart software and are included in flowchart category.